General Ulysses S. Grant's victories in the Civil War made him a national hero. His fame propelled him into the White House. Although Grant did not like politics and lacked any desire for political office, the death of Abraham Lincoln changed his plans. 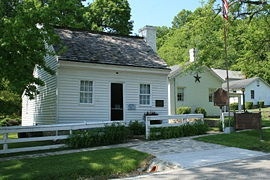 Regarding the Reconstruction Acts, Grant clashed with the new President, Andrew Johnson. Grant argued with President Johnson and challenged his views on the best way to reunite the nation. He aligned himself with the Conservative Republicans, who also supported Lincoln's views on reunification. It soon became clear that as a symbol of the Union victory in the Civil War, Ulysses S. Grant was the Republican Party's candidate for President in 1868. "I felt like anything rather than rejoicing at the downfall of a foe [Confederacy] who had fought so long and valiantly..." General Ulysses S. Grant referring to the Confederacy's defeat. 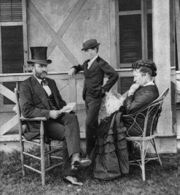 Photograph (right): President Grant with his wife, Julia, and son, Jesse, in 1872. Grant wrote in his memoirs about the Mexican American War: "I was bitterly opposed to the measure, and to this day, regard the war, which resulted, as one of the most unjust ever waged by a stronger against a weaker nation." The Personal Memoirs of Ulysses S. Grant is an autobiography of American President Ulysses S. Grant, focused mainly on the general's actions during the American Civil War. Written by Grant as he was dying of throat cancer in 1885, the two-volume set was published by Mark Twain shortly after Grant's death. The memoirs were a financial and critical success and are still praised for their high literary qualities.